Looking really great, nice when they hold on to make sure your still there, always got a good grip,well most do. Thanks Richard. I do get a little worried when he unravels and starts climbing on top of my arm because it feels like he's not gripping and could fall easily. Looking good Ckuhn003! Phantom looks great! He just needed to learn to trust you, and vice versa. He also needed to grow up a little and get out of baby defensive, "everything can eat me," mode! He will probably keep chilling out as he grows and you continue to have positive handling sessions with him. I got Behira at 430G or so, as a yearling, and was calm as can be. However, she definitely became more comfortable with handling after a month or two of gentle handling sessions. 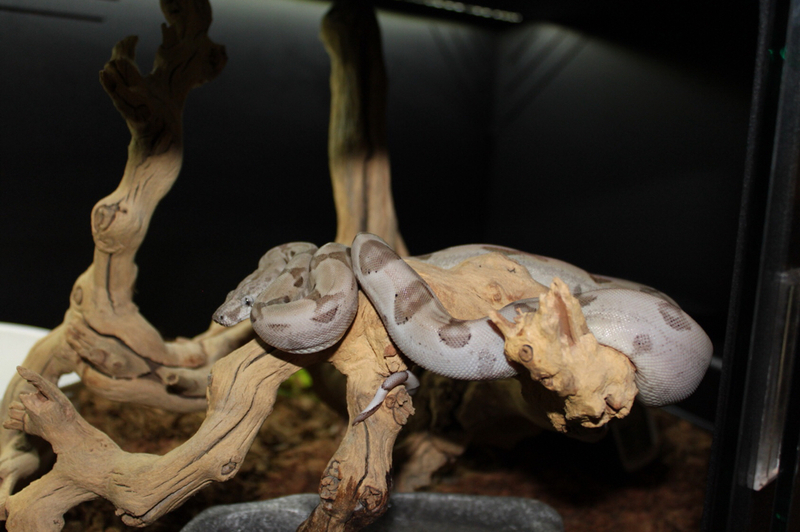 By 700-800G (about 4-6 months after I got her), she was falling asleep half the time she was out, on my chest while I was watching TV or chilling in the reptile area chair. She still likes to explore and is curious, but half the time, or after exploring, she just curls up on me and falls asleep! Phantom will get there. Keep up the good work! However, she definitely became more comfortable with handling after a month or two of gentle handling sessions. By 700-800G (about 4-6 months after I got her), she was falling asleep half the time she was out, on my chest while I was watching TV or chilling in the reptile area chair. Thanks Dave! I'm looking forward to those moments of just comfortably chilling. Sorry I haven't been able to leave any comments on Behira's or Yafe's thread lately but just know that I've been following a long closely. They both are looking great! I actually thought Yafe was a GTP after seeing those coiled shots today! Haha.... Absolutely stunning...both of them. No worries. If he's chilling out as much and as fast as you say, he will get there! 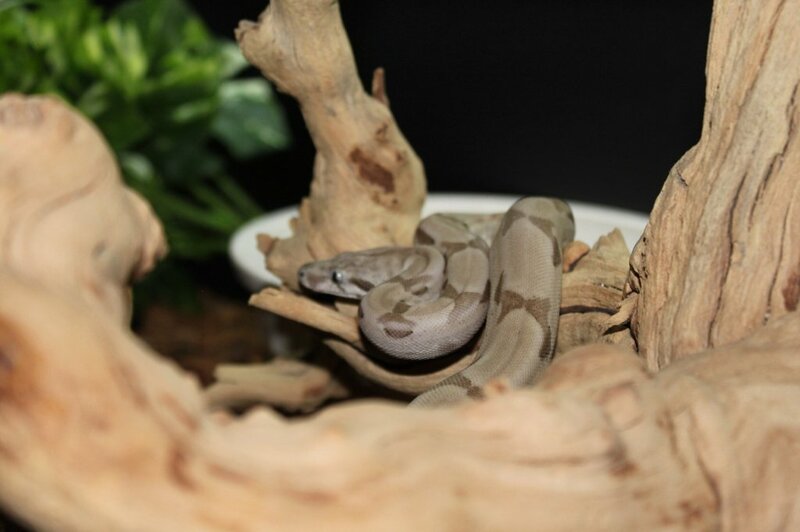 From what I have heard, Ghost's are not one of the more aggressive morphs either, so high probability of a chill animal, he appears chill and improving, and you are working with him. It will be awesome! He'll be a big boy and calm as can be. Thank you for following along with Yafe and Behira! Behira's doing great. She struck so hard and so fast at her 125G medium rat yesterday, I didn't even know what was happening until it was over! Boa food drive and strikes are colubrid style with a lot more force behind them! She's only 1,140G now! Going to be thrilling at 7,000G! You'll enjoy that too as Phantom grows. Yafe is improving dramatically every day. I expect a full recovery. Thank you for all the kind thoughts, for following along, and for mentioning it here in Phantom's thread. I'll stop now as I do not want to hijack the thread, but feel free to post on either of their threads anytime, or PM me. Last edited by dakski; 10-22-2018 at 02:59 PM. He's looking so handsome and gosh I still love that tail! And already growing wow! I bet you're excited to break qauranteine so soon! Really does feel like eternity doesn't it? Well thank you MissterDog! He's probably growing at a faster rate then my BP (Fred) since he hasn't refused any meals yet! Quarantine hasn't been too bad since it was more about trying to come up w/ a new enclosure which was pretty easy. I'm sure your quarantine days are coming to an end soon w/ your Russian Rat. Just wanted to provide an update on Phantom. He’s out of quarantine and three days ago he was transferred from his small tub to a huge AP T10 heated with an RHP. 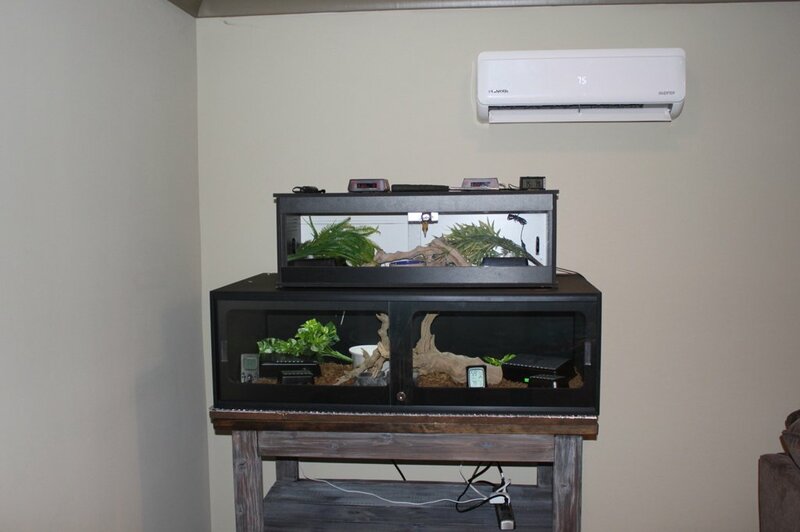 It’s amazing how small he looks in this new enclosure but I’ve tried to clutter it with multiple hides, water bowls, etc….Wanted to give Daski a lot of credit for helping me dial in the temps since this is my 1st time using a RHP. Still have some minor adjustments to make but I think it’s getting close to where it needs to be. 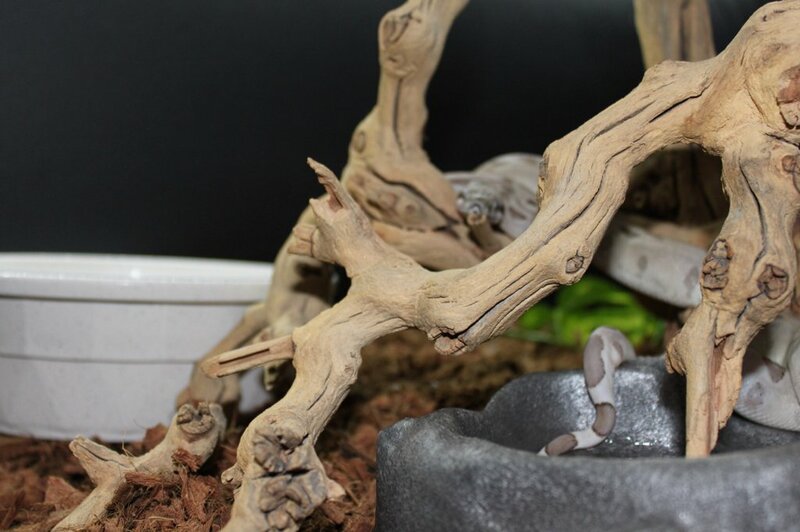 I’ve noticed Phantom spends ½ of his time in his cool side hide but what excites me the most is that I’ve found him hanging out in the branches of my driftwood basking under the RHP. I had a huge scare tonight when I went to check on him. Figuring he was in his cool side hide, I lifted up all four hides and couldn’t find him. I immediately panicked! What I didn’t realize he that he was 2 inches from my hand hanging out in the driftwood. His colors blend so well into the limbs. 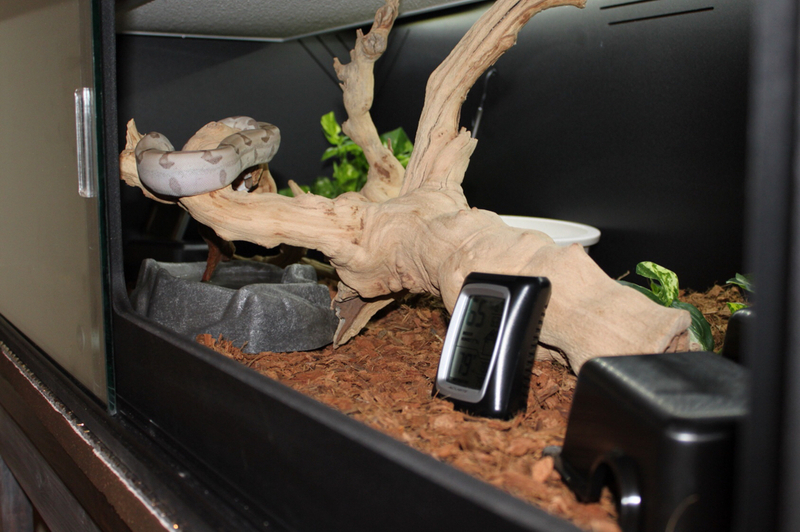 I’m attaching some pictures of Phantom hanging out as well as my setup. Thanks for the kind words brother. Happy to help any time. I’ve had scares like that and they are not fun. Heart skipped a beat, right? 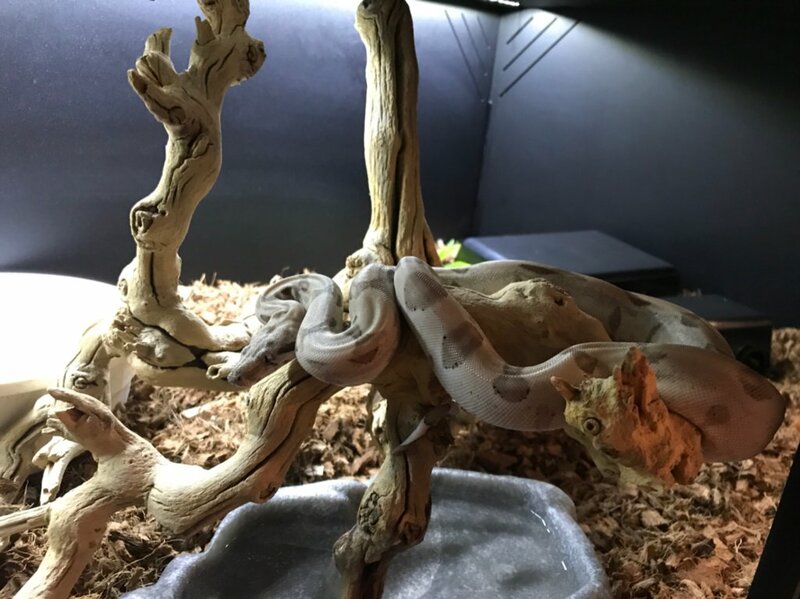 The day after 25g Solana went into her life home, a 3x2’ Boaphile, with 6 hides, I couldn’t find her. Lifted all 6 hides and started freaking out. Little turkey was under the paper wedged in the corner behind her water bowl. I’ve learned my lesson, she’s growing like a weed, and I am positive she cannot get out of there. However, for a minute there, I was about to cry. Phantom looks awesome and he’s going to love his new digs once he settles in. Looks really nice.